Leading Exporter of deriphyllin , etofylline / etophylline theophylline, budamate transcaps, formoterol budesonide, seroflo inhelar, salmeterol fluticasone propionate, asthalin inhaler , salbutamol / albuterol, ipravent rotacaps ipratropium and budamate transhaler from Nagpur. Deriphyllin tablet is used in the treatment of asthma. Take this medicine in the dose and duration as advised by your doctor. Swallow it as a whole. Do not chew, crush or break it. 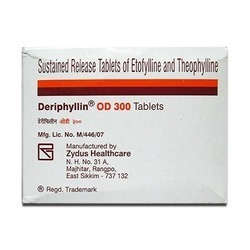 Deriphyllin tablet is to be taken empty stomach. Avoid deriphyllin tablet with caffeine and chocolate as well as food containing caffeine and chocolate such as tea leaves, cocoa beans. 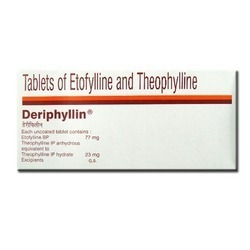 Deriphyllin tablet is a combination of two bronchodilators: etofylline / theophylline and theophylline. They work by relaxing the muscles in the airways and widen the airways. This makes breathing easier. Budamate 200 Transcaps Is Used In The Treatment Of Asthma And Chronic Obstructive Pulmonary Disease. Budamate 200 Transcaps Is A Combination Of Two Medicines: Formoterol And Budesonide. Formoterol Is A Long-Acting Bronchodilator Which Works By Relaxing The Muscles In The Airways And Widens The Airways. Budesonide Is A Steroid. It Works By Stopping The Release Of Certain Chemical Messengers That Cause Inflammation (Swelling) Of The Airways. Together, They Make Breathing Easier. 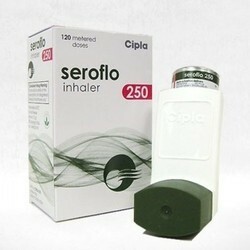 Seroflo 250 Inhaler is used in the treatment of asthma and chronic obstructive pulmonary disease. Check the label for directions before use. Shake the inhaler. While you are breathing in from a mouth, press down on the inhaler one time to release the medication and hold your breath for 10 seconds. Repeat until you have inhaled the number of puffs as suggested by the doctor. Afterward, rinse your mouth thoroughly with water and spit it out. Seroflo 250 Inhaler is a combination of two medicines: Salmeterol and Fluticasone Propionate. Salmeterol is a long-acting bronchodilator which works by relaxing the muscles in the airways and widens the airways. Fluticasone Propionate is a steroid. It works by stopping the release of certain chemical messengers that cause inflammation (swelling) of the airways. Together, they make breathing easier. Pregnancy weighs risks vs benefits Seroflo 250 Inhaler may be unsafe to use during pregnancy. Lactation Seroflo 250 Inhaler is probably safe to use during lactation. Limited human data suggest that the drug does not represent a significant risk to the baby. Nausea, Vomiting, Respiratory tract infection, Fungal infections in the mouth, Headache, Hoarseness of voice, Sore throat, Cough, Musculoskeletal (bone, muscle or joint) pain, Increased heart rate. 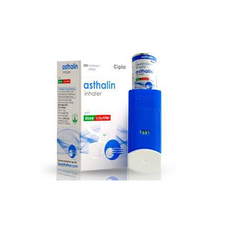 Asthalin 100 mcg Inhaler is used in the treatment of asthma and chronic obstructive pulmonary disease. Asthalin 100 mcg Inhaler is a bronchodilator. It works by relaxing the muscles in the airways and widens airways. This makes breathing easier. Asthalin 100 mcg Inhaler may be unsafe to use during pregnancy. Lactation Safe Asthalin 100 mcg Inhaler is safe to use during lactation. Human studies have shown that either the drug does not pass into the breastmilk in a significant amount or is not expected to cause toxicity to the baby. Driving No interaction found/establishedKidneyNo interaction found/establishedLiverNo interaction found/established. Usage/Application Ipravent Rotacaps is an anticholinergic medication. Ipravent Rotacaps is used in the treatment of chronic obstructive pulmonary disease and asthma. Take this medicine in the dose and duration as advised by your doctor. Swallow it as a whole. Do not chew, crush or break it. How to prevent capsule worksipravent rotacaps is an anticholinergic medication. It works by relaxing the muscles in the airways and widens the airways. This makes breathing easier. 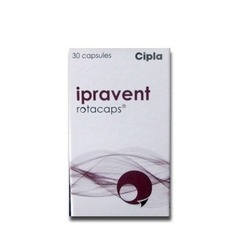 Ipravent Rotacaps may cause excessive drowsiness and calmness with alcohol. Ipravent Rotacaps is probably safe to use during pregnancy. Animal studies have shown low or no adverse effect on the fetus, however, there are limited human studies. Please consult your doctor. Ipravent Rotacaps is probably safe to use during lactation. Limited human data suggest that the drug does not represent a significant risk to the baby. What if you miss a dose of a prevent capsule? If you miss a dose of preventing rotacaps, take it as soon as possible. However, if it is almost time for your next dose, skip the missed dose and go back to your regular schedule. Do not double the dose. 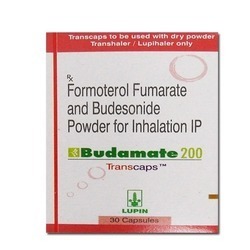 Budamate 200 Transhaler is used in the treatment of asthma and chronic obstructive pulmonary disease. Budamate 200 Transhaler is a combination of two medicines: Formoterol and Budesonide. Formoterol is a long-acting bronchodilator which works by relaxing the muscles in the airways and widens the airways. Budesonide is a steroid. It works by stopping the release of certain chemical messengers that cause inflammation (swelling) of the airways. Together, they make breathing easier. Pregnancy weighs risks vs benefits Budamate 200 Transhaler may be unsafe to use during pregnancy. Lactation Budamate 200 Transhaler is probably safe to use during lactation. Limited human data suggest that the drug does not represent a significant risk to the baby. Nausea, Vomiting, Respiratory tract infection, Hoarseness of voice, Fungal infections in the mouth, Cough, Headache, Sore throat, Musculoskeletal (bone, muscle or joint) pain, Increased heart rate. PR Deriphyllin OD 300 Tablet PR is used in the treatment of asthma. Use it as advised by your doctor or check the label for directions before use. Deriphyllin OD 300 Tablet PR is to be taken empty stomach. Take this medicine 1 hour before or 2 hours after food. You can take it with food if stomach upset occurs. Avoid Deriphyllin OD 300 Tablet PR with caffeine and chocolate as well as food containing caffeine and chocolate such as tea leaves, cocoa beans. Deriphyllin OD 300 Tablet PR is a combination of two bronchodilators: Etofylline / Etophylline and Theophylline. They work by relaxing the muscles in the airways and widen the airways. This makes breathing easier. Alcohol Caution Deriphyllin OD 300 Tablet PR may cause excessive drowsiness and calmness with alcohol. Pregnancy Weigh Risks Vs Benefits Deriphyllin OD 300 Tablet PR may be unsafe to use during pregnancy. Lactation Safe Deriphyllin OD 300 Tablet PR is safe to use during lactation. Human studies have shown that either the drug does not pass into the breastmilk in a significant amount or is not expected to cause toxicity to the baby. Avoiding breastfeeding for 2-4 hours after Deriphyllin OD 300 Tablet PR can further decrease the exposure of medicine to the baby.driving is not known whether Deriphyllin OD 300 Tablet PR alters the ability to drive. Do not drive if you experience any symptoms that affect your ability to concentrate and react.KidneyThere is limited information available on the use of Deriphyllin OD 300 Tablet PR in patients with kidney disease. Please consult your doctor. Liver Caution Deriphyllin OD 300 Tablet PR should be used with caution in patients with liver disease. Dose adjustment of Deriphyllin OD 300 Tablet PR may be needed. Please consult your doctor. Dexona tablet is used for allergy symptoms, severe allergic reactions, asthma, cancer, rheumatic disorder, skin disorders, eye disorders, and nephrotic syndrome. Take this medicine in the dose and duration as advised by your doctor. Swallow it as a whole. Do not chew, crush or break it. Dexona tablet is to be taken with food. How dexona tablet worksdexona tablet is a steroid which works by blocking the production of certain chemical messengers in the body that cause inflammation (redness and swelling) and allergies. 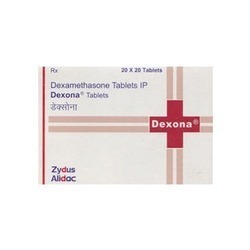 Dexona tablet related warningsalcoholinteraction with alcohol is unknown. Please consult your doctor. Pregnancy weight risks vs benefitsdexona tablet may be unsafe to use during pregnancy. Dexona tablet is probably safe to use during lactation. Limited human data suggest that the drug does not represent a significant risk to the baby. Do not drive unless you are feeling well. Dexona tablet may cause dizziness (vertigo). Changes in your eyesight or muscle weakness may also happen. This may affect your driving ability. Kidney dexona tablet is probably safe to use in patients with kidney disease. Limited data available suggests that dose adjustment of the dexona tablet may not be needed in these patients. Please consult your doctor. Regular monitoring of kidney function tests and other blood tests is advisable while you are taking dexona tablet. Livercautiondexona tablet should be used with caution in patients with liver disease. Dose adjustment of a dexona tablet may be needed. Please consult your doctor. Tiomate Transcaps is used in the treatment of chronic obstructive pulmonary disease. Trancaps must not be swallowed. Check the label for directions before use. Place the capsule at the base of transhaler, not in the mouthpiece. Twist the mouthpiece completely until you hear a click and breathe in deeply through the mouthpiece. Hold your breath for up to 10 seconds. If some powder remains in the transhaler repeat the process. 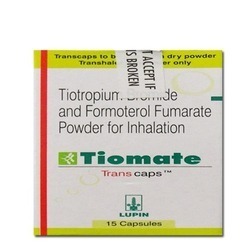 Tiomate Transcaps is a combination of two medicines: Formoterol and Tiotropium. Formoterol is a bronchodilator while Tiotropium is an anticholinergic. They work by relaxing the muscles in the airways and widen the airways. Together, they make breathing easier. Pregnancy weighs risks vs benefits Tiomate Transcaps may be unsafe to use during pregnancy. Animal studies have shown adverse effects on the fetus, however, there are limited human studies. The benefits from use in pregnant women may be acceptable despite the risk. Please consult your doctor. LactationTiomate Transcaps is probably safe to use during lactation. Limited human data suggest that the drug does not represent a significant risk to the baby. Monitor the baby for dry mouth, constipation, and urinary problems. driving interaction found/establishedKidneyNo interaction found/establishedLiverNo interaction found/established. 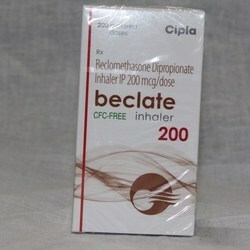 Beclate CFC Free 200 mcg Inhaler is used in the treatment of asthma. Beclate CFC Free 200 mcg Inhaler is a steroid. It prevents the cells in the lungs and breathing passages from releasing chemical messengers that cause inflammation (swelling) of the airways. This widens the airways and makes breathing easier. Beclate CFC Free 200 mcg Inhaler is used to treat a variety of conditions that require either reduction of inflammation or suppression of the immune system. Beclate CFC Free 200 mcg Inhaler can make it harder for you to fight off infections. Notify your doctor if you have any signs of infection such as a fever or a sore throat. Side effects such as mood changes or stomach problems can happen when you start taking Beclate CFC Free 200 mcg Inhaler. Inform your doctor if this bothers you. Do not stop taking Beclate CFC Free 200 mcg Inhaler suddenly without talking to your doctor first as it may cause worsening of symptoms. Special precautions for Beclate Inhaler Alcohol Interaction with alcohol is unknown. Please consult your doctor. Pregnancy weighs risks vs benefits Beclate CFC Free 200 mcg Inhaler may be unsafe to use during pregnancy. Animal studies have shown adverse effects on the fetus, however, there are limited human studies. The benefits from use in pregnant women may be acceptable despite the risk. Please consult your doctor.LactationBeclate CFC Free 200 mcg Inhaler is probably safe to use during lactation. Limited human data suggest that the drug does not represent a significant risk to the baby. What if You Miss a Dose of Beclate Inhaler? If you miss a dose of Beclate CFC Free 200 mcg Inhaler, take it as soon as possible. However, if it is almost time for your next dose, skip the missed dose and go back to your regular schedule. Do not double the dose. Hoarseness of voice, Sore throat, Oral infections. Combimist-L CFC Free Inhaler is used in the treatment of chronic obstructive pulmonary disease. 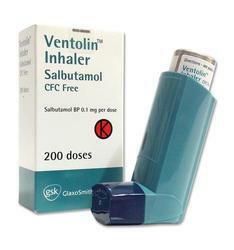 Combimist-L CFC Free Inhaler is a combination of two medicines: Levosalbutamol / Levalbuterol and Ipratropium. Levosalbutamol / Levalbuterol is a bronchodilator while Ipratropium is an anticholinergic. They work by relaxing the muscles in the airways and widen the airways. Together, they make breathing easier. Combimist-L CFC Free Inhaler may cause excessive drowsiness and calmness with alcohol. Combimist-L CFC Free Inhaler may be unsafe to use during pregnancy. Animal studies have shown adverse effects on the fetus, however, there are limited human studies. The benefits from use in pregnant women may be acceptable despite the risk. Please consult your doctor.LactationCombimist-L CFC Free Inhaler is probably safe to use during lactation. Limited human data suggest that the drug does not represent a significant risk to the baby. Deriphyllin retard 300 tablet pr is used in the treatment of asthma. Use it as advised by your doctor or check the label for directions before use. 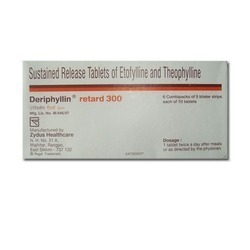 Deriphyllin retard 300 tablet pr is to be taken empty stomach. Take this medicine 1 hour before or 2 hours after food. You can take it with food if stomach upset occurs.Avoid deriphyllin retard 300 tablet pr with caffeine and chocolate as well as food containing caffeine and chocolate such as tea leaves, cocoa beans. Deriphyllin retards 300 tablet pr is a combination of two bronchodilators: etofylline / theophylline and theophylline. They work by relaxing the muscles in the airways and widen the airways. This makes breathing easier. 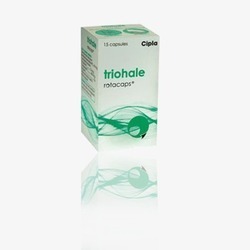 Triohale Rotacap is used in the treatment of chronic obstructive pulmonary disease. Rotacaps must not be swallowed. Check the label for directions before use. Place the capsule at the base of rotahaler, not in the mouthpiece. Twist the mouthpiece completely until your hear a click and breathe in deeply through the mouthpiece. Hold your breath for up to 10 seconds. If some powder remains in the rotahaler repeat the process. Triohale Rotacap is a combination of three medicines: Ciclesonide, formoterol, and tiotropium. Ciclesonide is a corticosteroid. It acts by stopping the release of certain natural substances in the body that are responsible for the inflammation of the airways. Formoterol is a bronchodilator, while tiotropium is an anticholinergic. They work by relaxing the muscles in the airways and widen the airways. Together, they make breathing easier. Pregnancy weighs risks vs benefits Triohale Rotacap may be unsafe to use during pregnancy. LactationTriohale Rotacap is probably safe to use during lactation. Limited human data suggest that the drug does not represent a significant risk to the baby. Monitor the baby for dry mouth, constipation, and urinary problems. Salbutamol respirator solution is used in the treatment of asthma and chronic obstructive pulmonary disease. Salbutamol respirator solution is a bronchodilator. It works by relaxing the muscles in the airways and widens airways. This makes breathing easier. Salbutamol solution related warnings alcohol no interaction found/establishedpregnancyweigh risks vs benefit salbutamol respirator solution may be unsafe to use during pregnancy. What if You Miss a Dose of Salbutamol Solution? If you miss a dose of salbutamol respirator solution, skip it and continue with your normal schedule. Do not double the dose. Budenase AQ Nasal Spray is used in the treatment of sneezing and runny nose due to allergies. Use this medicine in the dose and duration as advised by your doctor. Check the label for directions before use. Insert the bottle tip into one nostril and close the other nostril. Direct the spray away from the cartilage diving the two sides of your nose and toward the sides of your nostril. As you spray, breath gently and keep the head upright. Repeat in the other nostril. Budenase AQ Nasal Spray is a steroid. It gets absorbed into the cells of the inner surface of the nose and works by blocking the production of certain chemical messengers that cause inflammation (swelling) and allergies. This relieves blocked or a runny nose, sneezing and sinus discomfort. Pregnancy Weigh Risks Vs Benefits Budenase AQ Nasal Spray may be unsafe to use during pregnancy. Lactation Budenase AQ Nasal Spray is probably safe to use during lactation. Limited human data suggest that the drug does not represent a significant risk to the baby. Aerocort Inhaler is used for Asthma, Wheezing, Shortness of breath, Respiratory disease, Lung disorder, and other conditions. Check the label for directions before use. Shake the inhaler. While you are breathing in from the mouth, Press down on the inhaler one time to release the medication and hold your breath for 10 seconds. Repeat until you have inhaled the number of puffs as suggested by the doctor. Afterward, rinse your mouth thoroughly with water and spit it out. Aerocort Inhaler is a combination of two medicines: Levosalbutamol / Levalbuterol and Beclometasone. 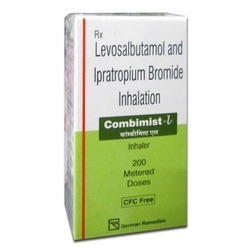 Levosalbutamol / Levalbuterol is a bronchodilator which works by relaxing the muscles in the airways and widens the airways. Beclometasone is a steroid medicine. It acts by stopping the release of certain natural substances in the body that cause inflammation (swelling) of the airways. Together, they make breathing easier. Hoarseness of voice, Sore throat, Fungal infection of the mouth, Respiratory tract infection, Headache, Muscle cramp. 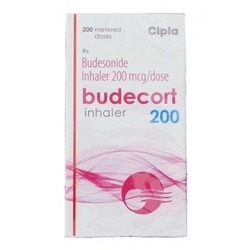 Budecort 200 inhaler is used in the treatment of asthma. Check the label for directions before use. Shake the inhaler. While you are breathing in from the mouth, press down on the inhaler one time to release the medication and hold your breath for 10 seconds. Repeat until you have inhaled the number of puffs as suggested by the doctor. Afterward, rinse your mouth thoroughly with water and spit it out. 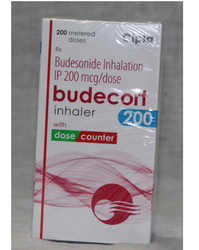 How budecort inhaler works budecort 200 inhaler is a steroid. It prevents the cells in the lungs and breathing passages from releasing chemical messengers that cause inflammation (swelling) of the airways. This widens the airways and makes breathing easier. Alcohol interaction with alcohol is unknown. Please consult your doctor. Pregnancy weighs risks vs benefits Budecort 200 inhaler may be unsafe to use during pregnancy. Animal studies have shown adverse effects on the fetus, however, there are limited human studies. The benefits from use in pregnant women may be acceptable despite the risk. Please consult your doctor. Lactationbudecort 200 inhaler is probably safe to use during lactation. Limited human data suggest that the drug does not represent a significant risk to the baby. Driving no interaction found/established kidney no interaction found/established liver no interaction found/established. 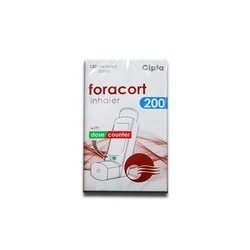 Foracort Inhaler 200 is used in the treatment of asthma and chronic obstructive pulmonary disease. Foracort Inhaler 200 is a combination of two medicines: Formoterol and Budesonide. Formoterol is a long-acting bronchodilator which works by relaxing the muscles in the airways and widens the airways. Budesonide is a steroid. It works by stopping the release of certain chemical messengers that cause inflammation (swelling) of the airways. Together, they make breathing easier. Foracort Inhaler 200 may be unsafe to use during pregnancy. Animal studies have shown adverse effects on the fetus, however, there are limited human studies. The benefits from use in pregnant women may be acceptable despite the risk. Please consult your doctor.LactationForacort Inhaler 200 is probably safe to use during lactation. Limited human data suggest that the drug does not represent a significant risk to the baby. driving interaction found/establishedKidneyNo interaction found/establishedLiverNo interaction found/established. Budecort 200 Inhaler is a steroid. It prevents the cells in the lungs and breathing passages from releasing chemical messengers that cause inflammation (swelling) of the airways. This widens the airways and makes breathing easier. Budecort 200 Inhaler may be unsafe to use during pregnancy. Lactation Budecort 200 Inhaler is probably safe to use during lactation. Limited human data suggest that the drug does not represent a significant risk to the baby. 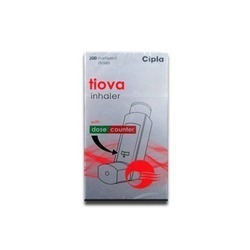 Tiova Inhaler is used in the treatment of chronic obstructive pulmonary disease and asthma. Tiova Inhaler is an anticholinergic medication. It works by relaxing the muscles in the airways and widens the airways. This makes breathing easier. Pregnancy weighs risks vs benefits Tiova Inhaler may be unsafe to use during pregnancy. LactationTiova Inhaler is probably safe to use during lactation. Limited human data suggest that the drug does not represent a significant risk to the baby. What If You Miss A Dose Of Tiova Inhaler? If you miss a dose of Tiova Inhaler, take it as soon as possible. However, if it is almost time for your next dose, skip the missed dose and go back to your regular schedule. Do not double the dose.